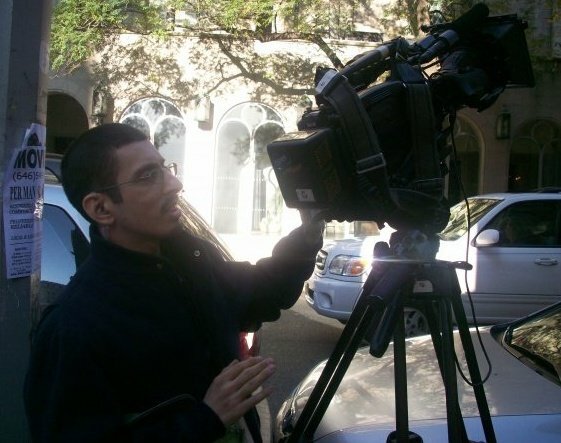 Gabe Rodriguez is an award-winning filmmaker, writer, and lyricist. He has worked on The Apprentice, Make Me a Supermodel, and Bill Moyers’ Journal, and been published in Hispanic Business, The World and I, and MovieMaker magazine. Through his moniker of HoneyDew546 Productions (the AOL screenname of an ex girlfriend) he has created several projects for the screen. His major works are the feature film FIGHTING NIRVANA, the television pilot LARRY RAVIOLI, and the three short films that make up his Life Trilogy: SUSIE IN THE AFTERLIFE, Q TO THE 6 TRAIN, and HAVANA IN BUSHWICK. At age 24, Gabe not only wrote and directed his first film, FIGHTING NIRVANA, but personally financed it. The result premiered in a Times Square theatre and was distributed by Echelon Studios. You can see FIGHTING NIRVANA’s official website at www.fightingnirvana.weebly.com. It is also currently available at Amazon.com here. SUSIE IN THE AFTERLIFE won the Spirit Award at The Queens World Film Festival in 2011. Q TO THE 6 TRAIN was selected by the Anthology Film Archives as part of a retrospective for the ten-year anniversary of 9/11, and has since played in part of The Subway Film Series. Read about the making of the film at here. Finally HAVANA IN BUSHWICK premiered in November of 2012 at The International Puerto Rican Heritage Film Festival and its making was covered by the publication Examiner. Gabe also made a web-based documentary called THE JOY THAT GOT AWAY, about the making of the cult classic RETURN TO OZ (1985, dir. Walter Murch). While an amateur and non-profit production, it continues to win approval from its most important critics: the Oz fanbase. G, how autobiographical is ‘Havana In Bushwick? Dorothy,Reinaldo Arenas,Harold and The Purple Crayon,even? Todd, sorry to be getting back to you a year in a half later, but I never saw this comment until now. Did you ever write that review of Havana In Bushwick? Please email me directly at p.gabe.rodriguez@gmail.com and we can chat that way.